The last time my girlfriend bit my ear-lobe, she got herself a gold ring from me.She has her own way of getting things from me. Little does she know that she is wearing an artificial gold plated ring ( worth Rs35/-) for the last two years. Talking about biting I often get reminded of my pet dog Bubbly. He was a champion biter. He was an infant pup when he first came to my place. Soon he started teething and that made him bite anything and everything that came under his viscinity. The mudguard in the car, my leather school shoe, the door mat, the poor brromstick,The rexin seat cover of my dad's scooter were a few victims of his biting skills. His biting spree stopped on that day when he tried his teeth on the cactus plant in our garden. I have seen other forms of biting too. People who smile so sweetly like Jessica Alba infront of you and at the same time ready to take a flesh out your back or even your bum for that matter. But none can beat the champion biter," Mike Tyson". He started his biting career by taking a portion of Lenox Lewis's thigh and later went on to polish his biting skills by taking a portion from Holyfield's ears. Eleven years have gone and Hungry mike is back. 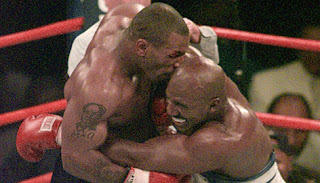 He is ready to take on Holyfield yet again this summer and this rematch is termed as the "idiotic sporting decision of the century".Hope Mike doesn't find a new place in Holyfield's body to test his canine power. Lucky you, you have a galfrnd to believe you gifted her GOLD ! Kiss from who? Renu? or someone else? I pity the doggy but it taught it to let the things alone. Hehehehe. You are sooo funny! welkum to my simple world of nutty blogging.. you too a victim of love bites? mmm.. ill hop down to your blog soon..
lol quite a few times.